College students can do more than just squash in to social networking and clicking best pictures for their profiles. 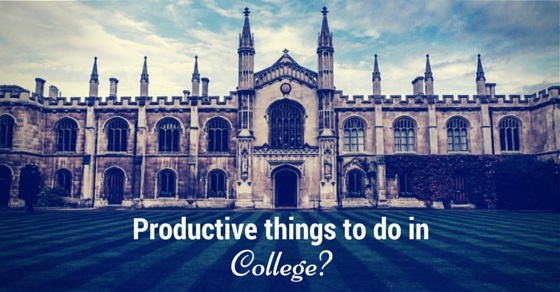 There are many other productive things college students can involve in. As a student it is essential to enhance your talents and knowledge while in college. It is the best time when you have the opportunity with sufficient time for yourself to get engaged in constructive things. You need to have strong intentions to stand out as a college student for which absorbing in productive activities will be more than beneficial. You are given below many ideas of prolific things to do in college. When you wake up early you get spare time to do everything on time. It helps you throughout your day to stay productive and do many things each day. In case you have your lectures in the morning do not miss it and try waking up early for it. Maintain the routine even during vacations so that it becomes a habit and you wake up early for college too. As you get any free time for yourself try to keep yourself engaged completing certain tasks. If you like to watch TV in your free time why not clean up your room as you watch or organize your books or clothes. As a college student you need to be highly productive and for which sufficient rest is imperative. You need to have a good night’s sleep for each day to be fresh, energized and have clear thoughts. You won’t feel irritated while being in the class. It facilitates in prioritizing things and accomplishing everything on time. When you do make a list you know what has to be done before other things and it does not let you to forget anything. This way you know nothing is left behind. You will successfully accomplish objectives once you have them written and strike them off the list as you keep completing each, which presents you an undeniable relief. Evaluate your to-do list each week so that you know what tasks have been on your list from more than a week. Complete those first to begin with another week. Your objective should be to complete most of the work on the list each day. Nevertheless you have to be realistic and know your limits of working for each day. You need to set a time limit for each tasks to be completed. This way you are motivated and finish off things on time. You cannot spend extra and excess amount of your precious time for a single project or learning. When you finish off the difficult things first, like some assignment or project that has been dangling in your head, you get time to relax rather than keeping things for the last minute. Procrastinating is never good especially with tough tasks. You will not fluster when you are well organized. If you are in a hurry and cannot find the books or stationery or anything to facilitate in college it might delay your day or frustrate you leading to a bad day. When you set a selected place for all your items like college books and ID, everything will be found easily and without wasting any of your time. You may have plenty of assignments and projects which are to be submitted. You should not keep it for the last minute and do an inferior work. But you should complete it before time and ensure quality time to be given to each project. When you do so, you are relieved and can relax prior to its due. As you build a routine you manage time. As you have control over the time, you get done numerous things as you know when you will have free time and you can set a time for each set of works to carry out. As you know your routine tasks you can skip doing excess of work a day. Start blogging about anything you are zealous about and you will undeniably stand out in your college group. You can learn and strengthen your knowledge on the subject you blog about and facilitate others. It is very advantageous for your future and you form a great impact on others by influencing them. You can learn something new while in college. Playing instruments or professional skills anything can be taken to add up to your skills. You can learn HTML or CSS coding online or by classes which makes you a valuable asset as student. Learn anything that you desire for and master it. While you are carrying on with your education, is there any language that has intrigued you and you desired to learn it? Well you can invest time in learning it. It is always helpful when you know more than just a two language. Reading is a constructive and favorable activity. Reading enhances comprehension and knowledge. As a college student it is essential to read for gaining information, learning and aiding your academic studies. College is an appropriate time in getting an internship. Seek an internship opening in the area of your interest and the career you hope for. You are going to acquire experience and learn many things. You will get to operate like a professional. Volunteer for your college’s welfare activities or search such activities in your community. It creates a great impact amongst your college or community. Learn how to manage your money. Evaluate what you spend on and try to save as much as possible. Set up a monthly plan for your finances. Your money handling abilities are boosted in this manner. Participate in the extracurricular activities in your college and be lively. Choose an activity in accordance to your hobbies. It will help to keep you energetic and always in the forefront. You get to learn a handful of things. You need to be fit which improves concentration and motivation to perform well. It also increases productivity. You can join a gym with a friend or go trekking or camping with friends. College is the best time to learn to drive. Get your driving license and help yourself to drive around for short distances or going to college. You need to be present in your class when the lecturer drops in a vital test or grants credits for attendance. If you have professors that have corresponding successful career, who can guide you through your college years and help you in the future as well, you need to be well in contact with such influential people. They can provide you professional advice, reference for internship programs or even write for you reference letter. If you know some influential seniors who are thriving in their college life, you can even take their guidance for your college facilitation. As you create one, you get to connect with the professors easily and take required guidance and give your regards timely. You can join in groups that are professional and can help you in college studies or projects. You can even join in your college’s group, if they have one, to follow what latest is happening in your college. You need to set goals for your academic performance for your prospects. Fix a target percentage or GPA for the year or semester respectively. After you settle on it you can strive hard to accomplish the same. It may sound difficult but if you spend one hour learning each day whatever was taught that particular day, you are well prepared by the time of your tests or semester exams. When you atleast read what you were taught in class it keeps compiling to your memory rather than mugging up everything in the last minute. Sometimes dates, terms, names or mathematical formulas are difficult to memorize. Build your own memorizing techniques from the first day itself. For instance, to remember all the important points of a single answer you memorize the initials of each point and then try to understand the adjoining explanation. Find and practice your own memorizing techniques. You can form a study group along with your friends. It helps you to regain any knowledge that you missed due to a leave in college or they facilitate you with their studying techniques or extra notes. Get in touch with your professors in case you are ambiguous about any topic or subject. You should participate in your college festivals or join in departments to help out event management. The fests are certainly to be attended by guests or judges who are well known in different fields and are successful in their career. Chances are you get spotted by one or in any case you build a contact with some. Lastly, try to be active student throughout your college life. Endeavor to survive the fullest of your college life and excel in all the activities. Do not forget to be enjoying with whatever things you are carrying out. When you enjoy the tasks and stay intrigued as you acquire knowledge, you turn out to be more productive as a student.